An important aspect of the long lifespan of your garage door comes through maintenance and repairs. At Wessex Garage Doors we offer a wide range of services. Here are some of the questions we are most frequently asked about garage door repair. Your garage door is a regularly-used piece of equipment and as such we recommend that you have your door serviced at least once a year to ensure that it remains in excellent condition. If you are interested in having regular servicing through Wessex Garage Doors, we would be happy to set you up with a bespoke service plan in advance. For the best longevity for your new garage door, we can arrange for our experienced engineers to carry out a full servicing of your door. We can offer a broad range of servicing options including a completely tailored package to suit your needs. For new garage doors and electric operators that Wessex Garage Doors have installed we would recommend enrolling in our Service Passport scheme. Are you able to repair garage doors? If your garage door is in need of repairs, our team of expert and fully trained engineers can help you. We can arrange for a site visit to take a look at your garage door to establish the nature of the problem and then provide you with a full quote to get the issue sorted. Please get in contact with us to arrange a visit. What should I do to look after my garage door? To keep your garage door in the best possible condition we recommend that all of the moving parts should be cleaned and then sprayed with a silicon-based lubricant at least every four months. Do not use grease on the running tracks – just keep them clean. Avoid oiling lock cylinders – if necessary, lubricate with graphite dust instead. You should wash your garage door with a mild soap-based solution every few months. In coastal areas wash more frequently to remove salt and especially remove bird droppings from GRP doors as soon as you can – both are particularly corrosive. Remember, where applicable, to apply/repeat finishes at intervals as advised by the stain/paint manufacturer. Do not paint springs. For the best possible care for your door we would also advise investing in regular servicing. How often does a garage door need to be repainted? 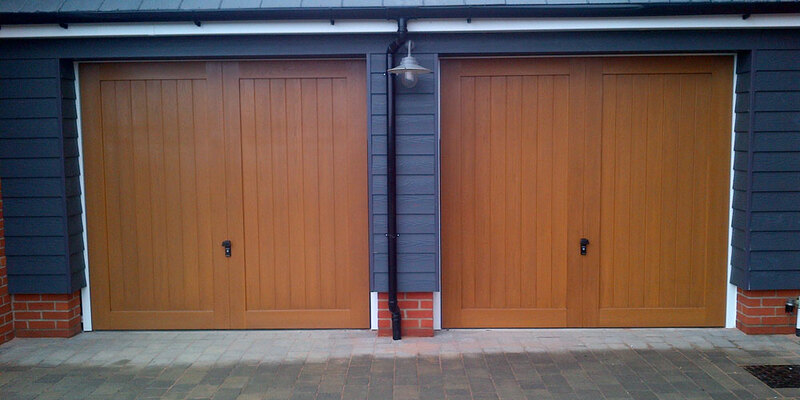 All of our painted garage doors are provided with a 10 year guarantee on finish.